I don't know about y'all, but I'm a sucker for a good piece of show posterage. The medium really took off in the 60s, when those incredible psychedelically-influenced posters began to grace the music-loving world with their brilliant colors and wonderfully maddening swirls. These days, poster art is alive and well. Naturally, I've decided it's a subject worth paying attention to. Being sick is no fun, y'all. The list of reasons proving this is pretty much endless, but up there near the top is the one where being really sick is a drag because you miss farewell shows. And yes, chalk that one up to personal experience of the sadfacest utmost. 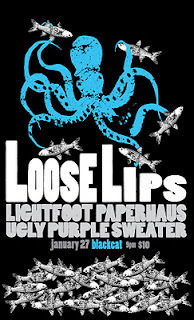 DC's own Loose Lips gave the city a farewell bow last Friday, and yours truly still has the sads about missing it thanks to a seriously epic cold. But I've got memories, and we can all share in the joy that is this killer (band-designed! - thanks to the one and only Andrew Diego) poster art. Loose Lips, you are missed. Thanks Megs, the poster was created by Mr. Andrew Diego.